Smart pills are capsule-sized ingestible medical devices consisting of elements such as sensors, cameras, patches, and trackers that help in better diagnostics, patient monitoring, as well as targeted drug delivery. They are majorly available in the form of a vitamin capsule sized pill and possess small wearable sensor patch, an application on a mobile device, and a provider portal. Once swallowed, it gets activated in the gut; the sensors provide information about patient’s health parameters and the effectiveness of medication treatment leading to more informed healthcare decisions and optimized therapies. Moreover, smart pills have revolutionized the field of gastrointestinal diagnosis. Smart pills, being non-invasive can be a potent alternative approach against invasive procedures such as gastrointestinal endoscopy/colonoscopy. The global smart pills market was valued at $257 million in 2017, and is expected to reach $650 million by 2025, registering a CAGR of 12.1% from 2018 to 2025. A considerable increase in geriatric population, rise in chronic disorders such as cancer, diabetes, and others, and surge in prevalence of lifestyle-related disorders, such as obesity, gastroesophageal reflux disease (GERD), gastric ulcers, and others majorly drive the growth of the smart pills market. In addition, increased R&D investments in developing smart pills further boost the market growth. 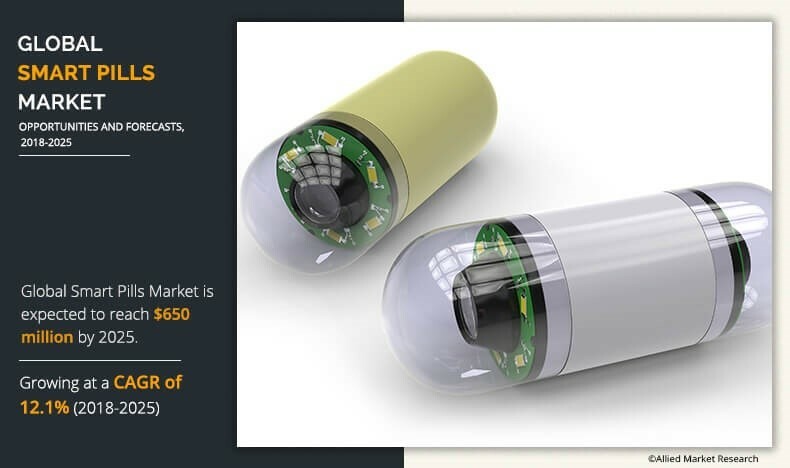 However, stringent government regulations regarding the increased use of these devices and high cost associated with the ingestible sensors are the factors anticipated to restrain the growth of the market. Furthermore, rise in technological advances pertaining to smart pills such as bioelectronics, availability of microprocessors, micro-cameras, miniaturization, and others are predicted to offer lucrative opportunities in future. 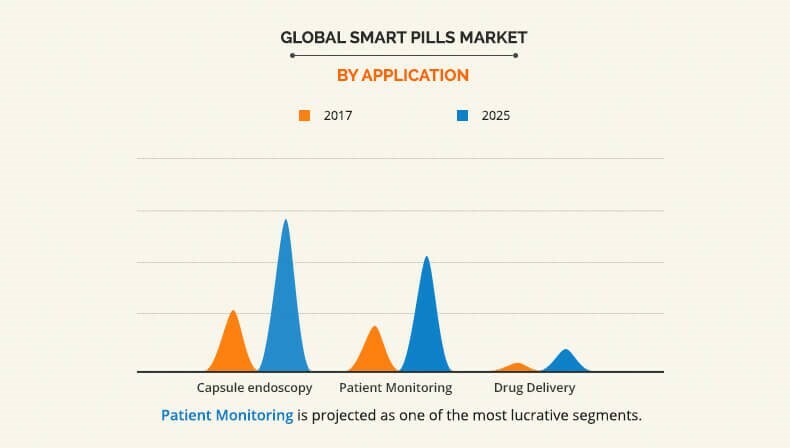 Based on application, the smart pills market is bifurcated into capsule endoscopy, drug delivery, and patient monitoring. The capsule endoscopy application segment was the highest contributor to the market, in 2017, and is anticipated to maintain its dominance throughout the forecast period. This is attributed to the increase in preferences toward non-invasive diagnostic procedures and the significant increase in gastrointestinal disorders across the globe. 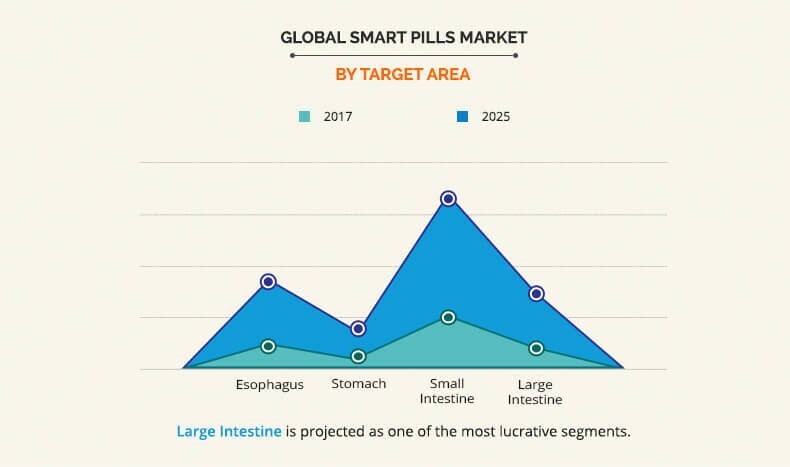 Based on the target area, the smart pills market is classified into the esophagus, small intestine, large intestine, and stomach. The small intestine target area accounted for the highest revenue in 2017 and is expected to maintain its dominance throughout the forecast period. This is attributed to the significant increase in small intestinal disorders such as Crohn’s disease, celiac disease, and small bowel tumors. Based on region, the smart pill market is analyzed across North America, Europe, Asia-Pacific, and LAMEA. North America dominated the market in 2017, accounting for highest share, and is anticipated to maintain this trend throughout the forecast period. However, Asia-Pacific is projected to register the highest growth rate from 2018 to 2025. The study provides an in-depth analysis of the smart pills market with the current trends and future estimations to elucidate the imminent investment pockets. Comprehensive quantitative analysis of the industry is provided from 2018 to 2025 to assist stakeholders to capitalize on the prevailing market opportunities. Extensive analysis of the key segments of the industry helps to understand the trends in smart pills market globally. Smart pills are capsule-sized ingestible medical devices that consist of sensors, cameras, patches, and trackers that help in better diagnostics, patient monitoring, as well as targeted drug delivery. Smart pills, being non-invasive can be a potent alternative approach against invasive procedures such as gastrointestinal endoscopy/colonoscopy. 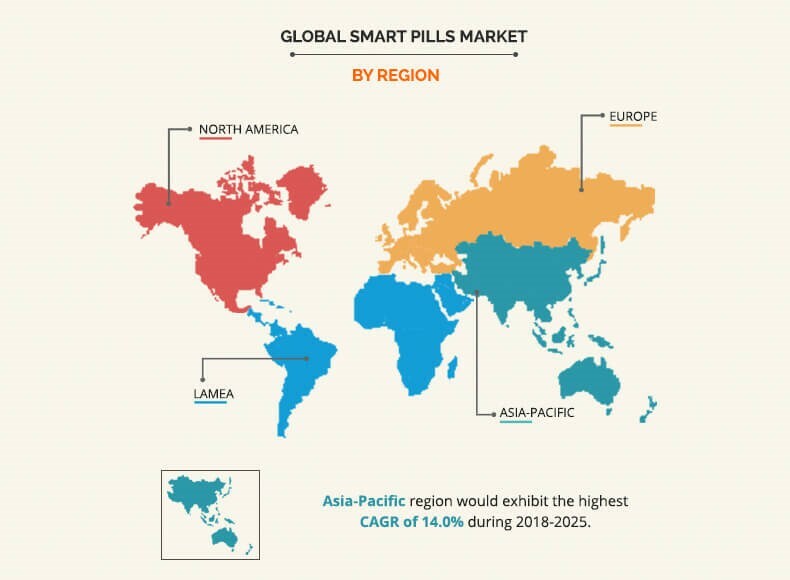 The major factors that drive the growth of the global smart pills market are rise in R&D expenditure pertaining to smart pills, increase in per capita expenditure on healthcare in developing economies, and favorable government regulations. The major factors that contribute to the market growth include increase in geriatric population, rise in gastrointestinal disorders such as GERD, colorectal cancer, and others. In addition, increased use of smart pills in diagnostic centers and hospitals for the diagnosis of the disease significantly drives the growth of the market. Further, smart pills are being considered as a potent alternative to traditional, painful, endoscopic procedures, which also is expected to fuel the market growth. Moreover, capsule endoscopy accounted for the largest market share in the application segment owing to its increased use in diagnostic procedures for gastrointestinal disorders. Capsule endoscopy is being widely performed to diagnose the aforementioned disease indications and thereby, significantly contributes for the growth of smart pills globally. 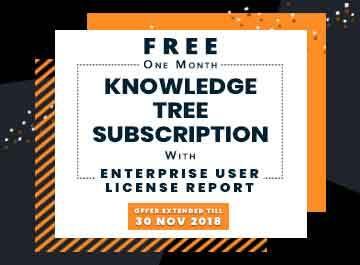 There have been remarkable advancements as well as some major developments, such as devices with more throughput and accurate results, in this market. Nevertheless, the growth in need of non-invasive devices has increased the demand for innovative technologies along with newer versions of capsule endoscopes.